The Monument of Monument Creek: a spire of 545 million year old Tapeats Sandstone perched on 1.7 billion year old base of Trinity gneiss. 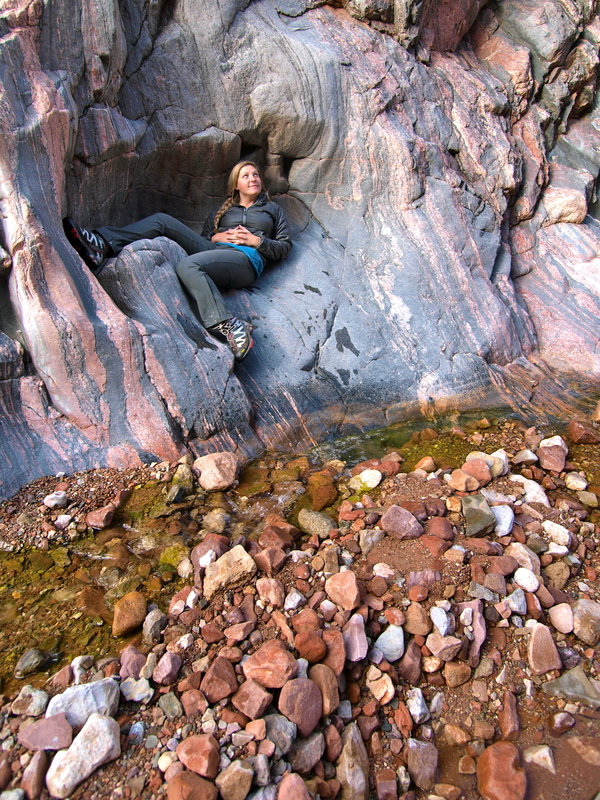 The 1.2 billion missing years between the two layers is known as the “Great Unconformity”. Every year for the past five years, I have climbed a mountain on my birthday. 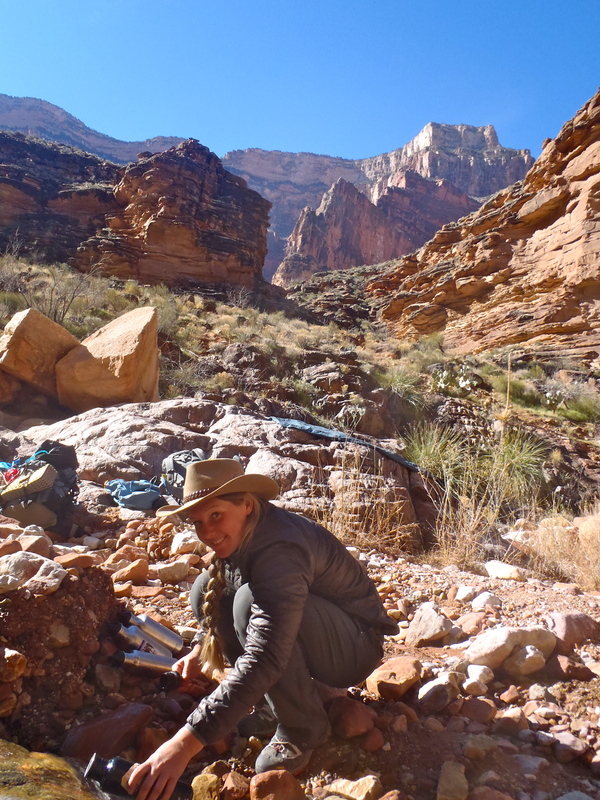 Last year, I tackled the inverted mountain that is the Grand Canyon, where 5,000 vertical feet separate the rim from the river. I arrived at the bottom, on the shores of the blue-green Colorado, on my 30th birthday. After spending our first day descending into the canyon via the Hermit Trail, we spent a night at the headwaters of Monument Creek. In the morning, we bypassed the Tonto Trail running east in favor of hiking down to the river through the narrow slickrock slot canyon that holds Monument Creek. After the previous day’s hike in the sun, walking alongside cold, clear running water was a gift. Filling my water bottle at the headwaters of Monument Creek. We treated our water with Aquamira drops or by boiling. The Pima Point overlook is above, on the right. Monument Creek runs through one of the thousands of side canyons that trickle down from the North and South rims and empty into the Colorado. 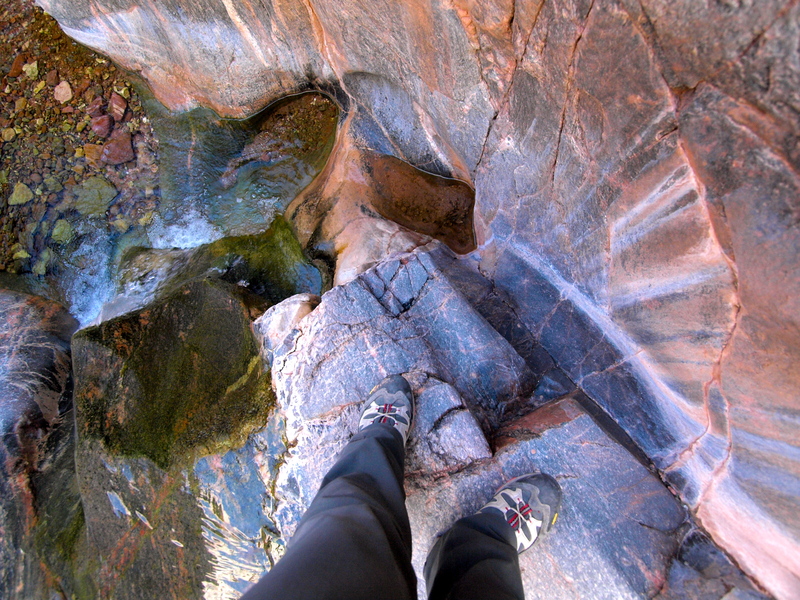 Many of these canyons end in sheer drops of hundreds of vertical feet; Monument Creek is much easier to navigate to the river, only requiring a few short sections of stemming to keep your boots dry. 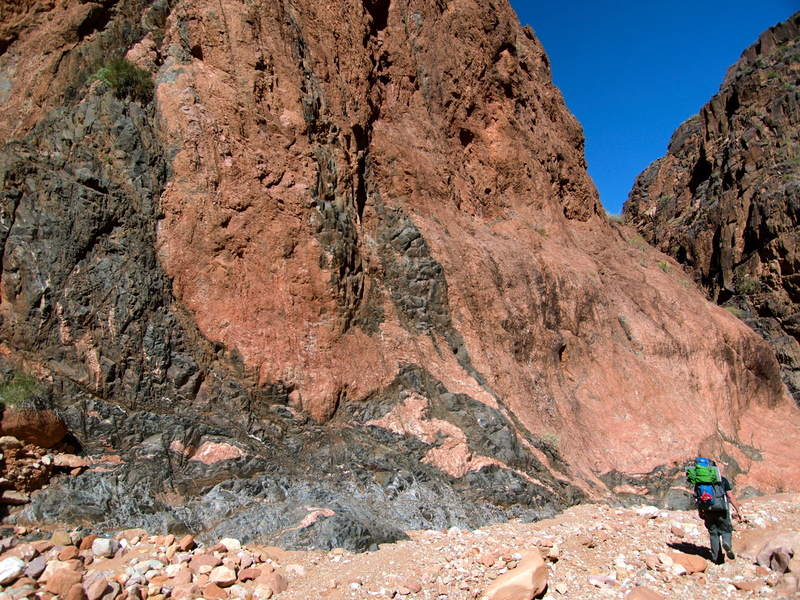 This time of year, on a clear sunny day, Monument Creek makes for easy canyoneering. I would not want to be there in a storm; flash floods have sculpted and scoured the channel smooth in the way that only violent water can. 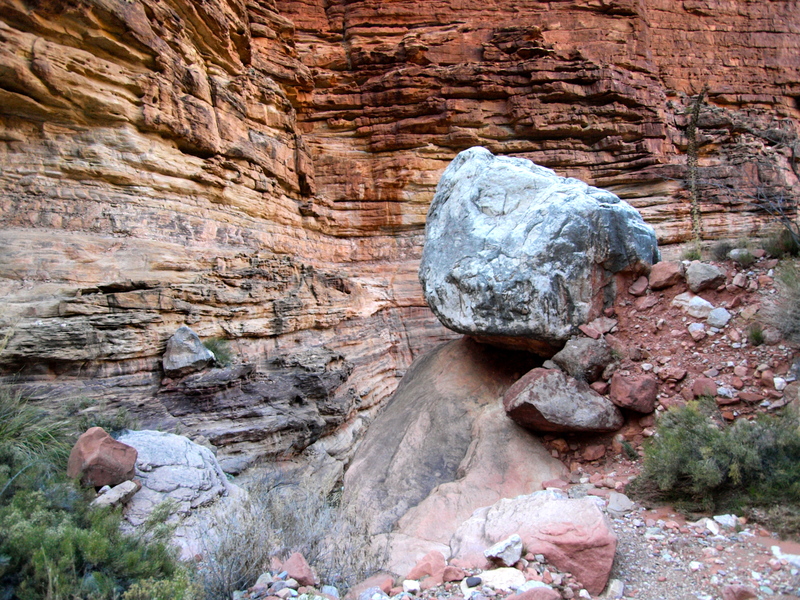 In a few places, nicks slashed into the canyon walls by hurling boulders have been widened into nooks large enough to sit in quite comfortably, on a dry day. 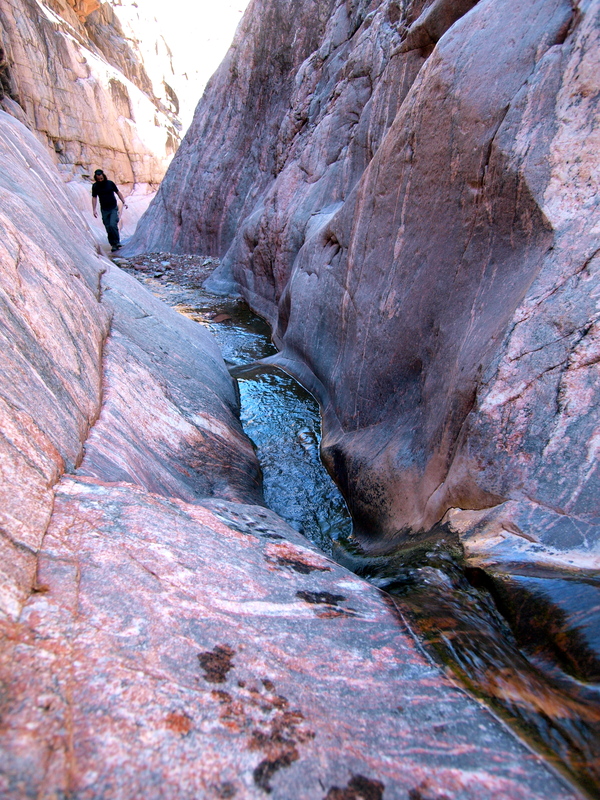 Monument Creek has cut this narrow canyon down to the Colorado, to the basement of the Earth: the wide, glittering veins of black Vishnu Schist and pink Zoroaster Granite formed nearly 2 billion years ago, when the Earth was just beginning to cool enough for rocks to form out of molten lava. These rocks are ancient, hardened by time and pressure into glittering walls of metamorphic rock. As we made our way down through the canyon, the stream bed widened into a graveled channel and the creek disappeared at our feet. As we neared the Colorado, the sound of the big river grew louder with every rounded bend. We dropped down to the water table and the stream reappeared, without fanfare, first as wet sand, then a trickle and then, once again, a creek. Rounding the last bend of Monument Creek, we passed through a miniature forest of red tamarisk and emerged on the white rocky banks of a shockingly green Colorado River. Our packs at the Colorado River! I’d seen the Colorado before from a distance: looking down from the North and South rims and stoppered into an artificial lake at Glen Canyon in southern Utah, but never this close and never this fast. The Colorado may be tempered up and downstream, but I was relived to see that here, the river still runs wild. 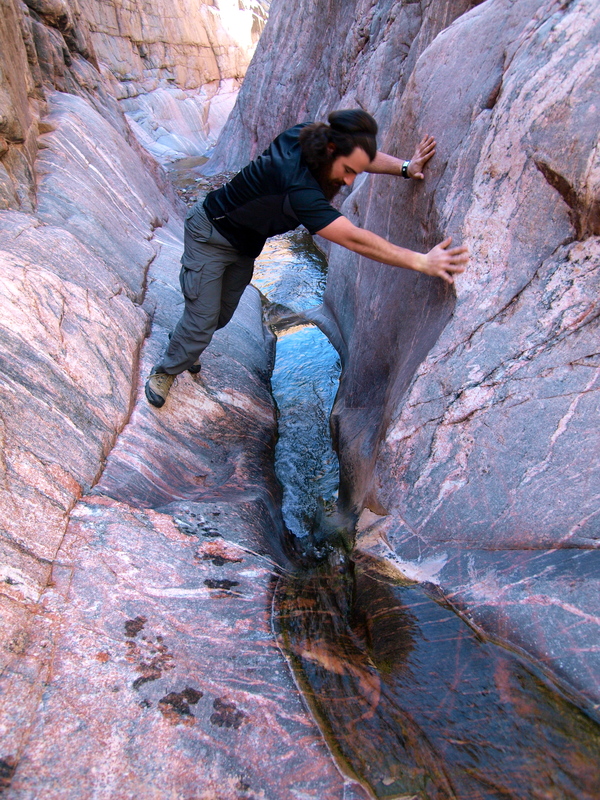 River rapids are created by boulders and debris brought down from side canyons by flash floods. The narrower the river channel and the bigger the underwater debris field, the bigger the rapids. The white water at the mouth of Monument Creek is known as Granite Rapids, rated an 8 out of 10 on the Grand Canyon scale. 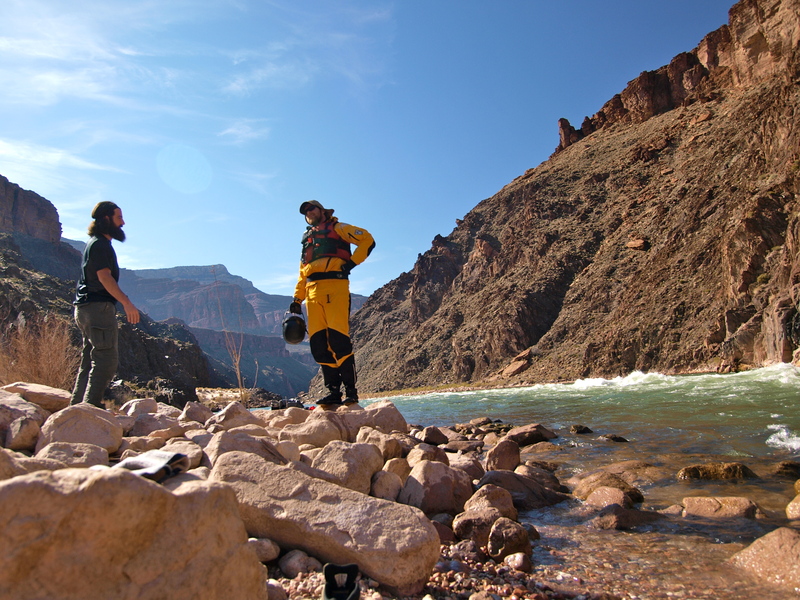 Most other white water is categorized on a scale from I to VI, but the Grand Canyon is not most other white water. 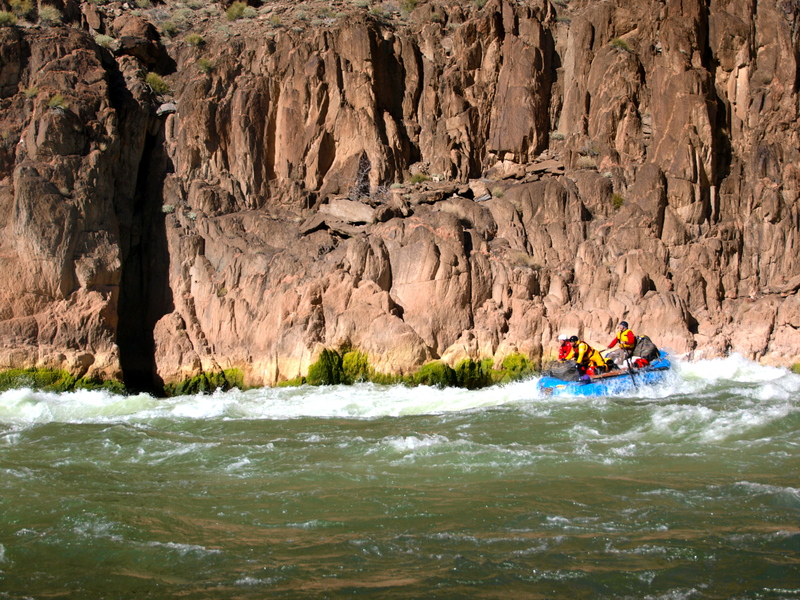 In the winter, rafting trips on the Colorado are restricted to one private party a day. Enthusiasts play the lottery for years and some pay thousands for the opportunity. We didn’t expect to see any rafting parties, but serendipitous things sometimes happen on birthdays. 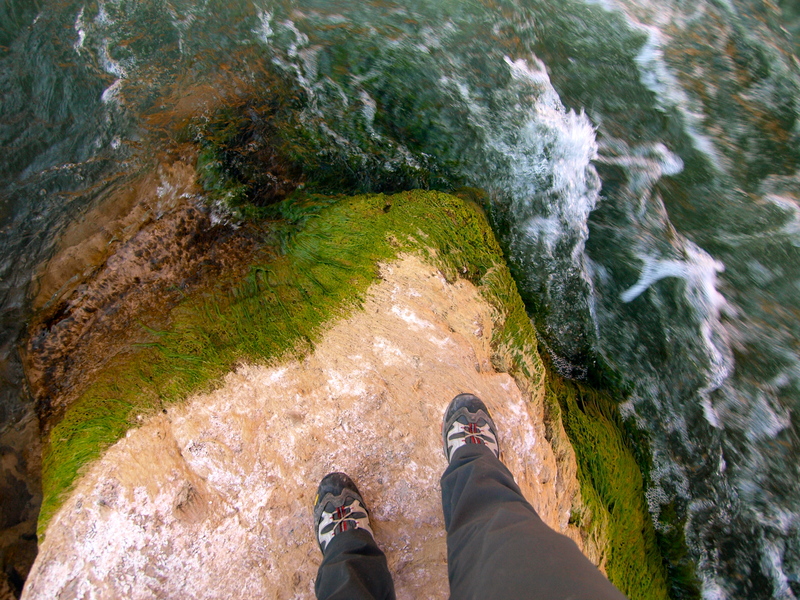 Sitting on a rock by the water, within reach of the spray from a particularly gnarly looking rapid directly in front of us, I turned and saw an astronaut. He was a rafter, dressed head to toe in a bright yellow rubber suit with a helmet and face guard and tools and ropes dangling from his life vest. He told us he had jumped out upstream to spot his mates through the rapids. We had plunked ourselves right in front of the scariest stretch of water in this part of the river: a hydraulic feature notorious for sucking down entire boats and holding them underwater. The spotter’s job was to stand on the shore by the hydraulic and throw a rope to anybody unlucky enough to end up in the drink. The three of us watched as the raft closely hugged the far wall, staying as far from the hydraulic as possible. When they flew past, we let out a big whoop and the rafter ran back upstream to catch the next raft through while the first boat pulled up on the beach and a woman, in blue, took the spotter’s position with the rope. The second raft followed the same line and everybody whooped again. Our itinerary called for us to hike back up Monument and head another 4 miles east to Salt Creek to camp for the night, but the Colorado was calling us to stay. Itineraries be damned. We camped by the river, no tent, under spectacular stars. The sound of the rushing river was so beautiful, the new moon stars so bright, that I stayed awake most of the night, watching and listening and relishing all the hours of the best birthday anybody has ever had. 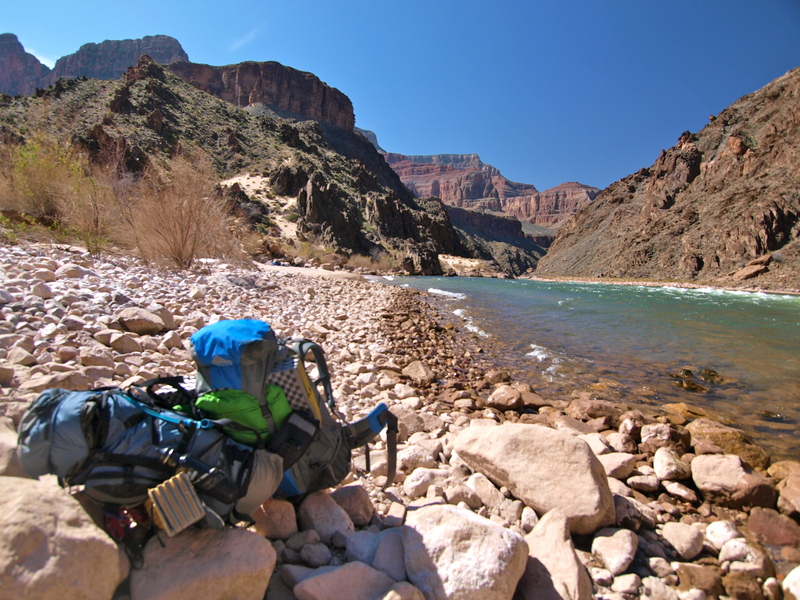 This entry was posted in Hiking!, Photography, Uncategorized, Vagabonding 101 and tagged backpacking, Colorado River, grand canyon, rafting, winter. Bookmark the permalink. 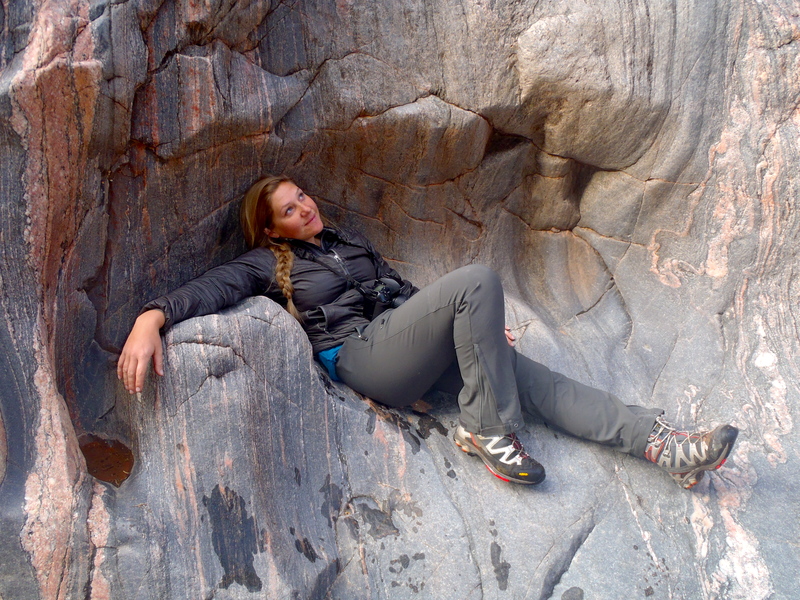 I have been down the GC in a group and it was amazing but your hike looks so peaceful and wonderful. What a 30th! How long can you trek before encountering other people? I would just love that sense of solitude. In the teeny tiny country I live in I can go off walking places, places I may regard as remote, but never anywhere that I am truly alone. How does it feel? What a beautiful spot. The striations in the rock remind me of the Painted Wall at the Black Canyon of Gunnison N.P. I think the word “awesome” was created to dbcsriee the Grand Canyon. Truly, the feeling one gets cannot be explained in words or pictures. It is one of the most naturally spiritual places I have ever experienced. If you ever have the chance, go! 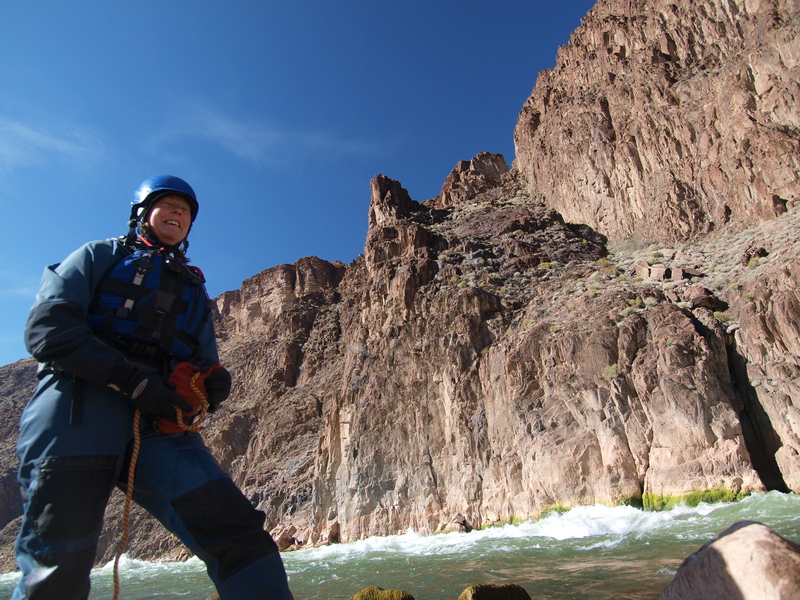 I did the 8 day raft trip of the whole canyon for my Birthday a couple years ago. It is an experrience I will never forget. Amazing place !!! Some of the canyons we hiked up where unlike any places I have ever been to. Great way to spend a BIrthday. Happy Birthday to you. DREAMY!!!! A perfect birthday!!!! Happy birthday!